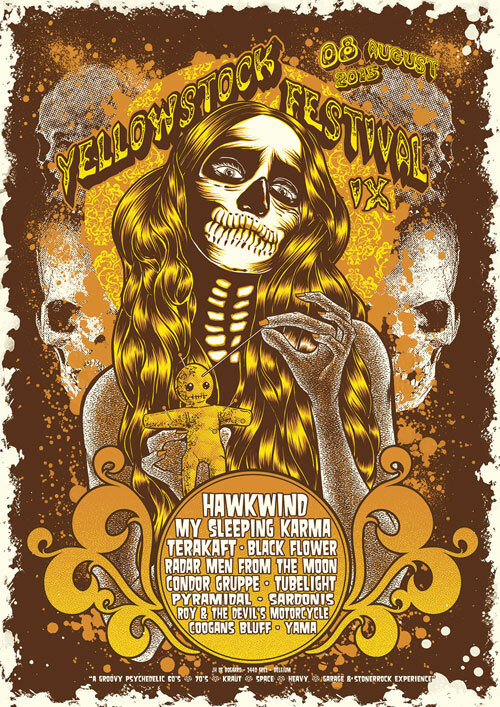 Home » News » Yellowstock 2015 With Hawkwind, My Sleeping Karma, Radar Men From The Moon & More; Tickets Still Available! Just across the border near Tilburg, lies the small Belgian town of Geel. Every year Geel is home to one of the coziest, little festivals that brings you a couple of favorites in the heavy, spaced out tradition you all know and love. This year’s edition on the 8th August has some particularly tasty names going for them and the Shaman will be present to witness all of that. Yellowstock is the name of the festival, a reference to the town name, which translates as ‘yellow’. The rest is self-explanatory, this year the festival celebrates its ninth edition already. Previously the festival has hosted bands like Bong, Gnod, Moon Duo and Baby Woodrose. That is obviously just the tip of the iceberg. A wide variety of bands have played on the stage at the Boogaard, from young talent to old heroes. This year the festival boasts a line-up that should get the psychers, stoners and old hippies hop in their transports and head for the festival, because the mighty godfathers of all that is trippy are playing: Hawkwind. It has been 10 years since the band visited Belgium, but now they are back and you can now witness them live. Yellowstock’s favorite band My Sleeping Karma will also be playing, and so are Dutch spacerockers Radar Men From The Moon. The first just released the brilliant Moksha, which is a meditative journey to the east, the other is getting ready for album number three, so don’t miss a chance to catch some new tunes early. Drift away on the desert blues of Terakaft and make a journey with the world jazz from Black Flower. Surf the waves of kraut meets spaghetti western with Condor Gruppe from Antwerp and leave the milky way with Pyramidal from Spain. There’s no need to go on, but we will. Tubelight already showed their colors on this year’s Eindhoven Psych Lab and not without reason. Tilburg’s own Yama is going to bring some stoner rock in the way you love and crave it. For those who want doom, there’s SardoniS, but expect a bit of groove too. Roy & The Devil’s Motorcycle are a safe bet for some good blues and garage rock to sink into and Coogan’s Bluff kicks the whole circus of with their groovy rock. To practical matters then, there’s many ways to get to Geel and there is a campsite, where also a pre and after party will take place. Tickets are still available, priced at €35 and can be purchased HERE, so put some heavy in your summer holiday, The Shaman recommends it!